Thorough descriptions and keen insights vividly illuminate naval life. 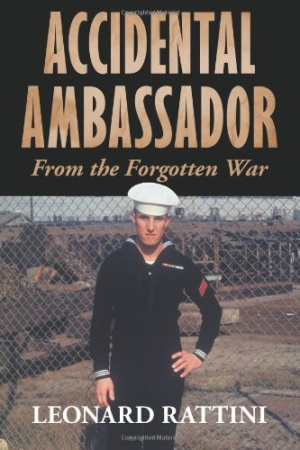 Accidental Ambassador: From the Forgotten War is Leonard Rattini’s memoir from his childhood in Cleveland, Ohio, to his time in the US Navy during the Korean War, and how a grave injury in the waters off Mexico changed the course of his life. Though decades have passed since the events of the book, Rattini skillfully captures his own endearingly brash naiveté as a young military recruit—particularly evident in his colorful, humorous descriptions of boot camp. Through clear writing and a well-crafted, natural tone, the book shows his process to maturity. Finally, Rattini was moved to a Pakistani ship that was heading to Panama. He arrived in time to get the medical attention needed to heal the injury; along the way, he forged friendships with the Pakistani sailors, especially one named Sadulla Khan. His cross-cultural experience represents his shift from youth to maturity. This unexpected international goodwill is where the book gets its title. The book’s impeccable thoroughness and accuracy in relaying historical facts are the biggest interruptions to to the suspense and pace of the story. The book is so diligent in building the backstory that the main events—Rattini’s injury, Pakistani friendships, and hospital time in Panama—don’t happen until the last quarter of the book. This narrative approach presents an understanding of naval life, but interest may dwindle before the pivotal scene. In general, key scenes feel too brief. It seems every scene and detail in the book is given equal weight, rather than investing more deeply in the most important events. The photos in the book add insight and a personal feel but are poorly reproduced, even for old photographs. The glossary is fairly exhaustive for a work of this size, as most terms are easy enough to understand that they don’t hinder the story; however, the glossary itself is a fascinating compendium of military life. Readers who want a more in-depth understanding of naval life in the 1950s will enjoy Rattini’s generous insights.